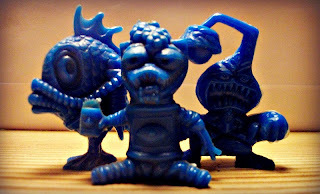 So, there's these wacky-looking plastic monsters that I've come across photos of quite often, but until recently hadn't really been able to place. The above images show a handful of them. Over the past month or two I got the three shown in the top photo, and TwoHeadedBoy (who runs the blog on neglected comics called TwoHeadedThingies--check it out) was kind enough to contribute the other photos in this post of additional Monstruos from his collection. They are premiums called "Monstruos de Matutano" that came in snack bags and/or cereal boxes in the late-1970s to early-1980s, originating in Spain and Portugal and later being reproduced in South America. The names "Disvenda," "Tito" and "Dunkin" are also commonly listed in association with them, although I'm not sure if those are company names, product names, or what. There are 20 different sculpts. You can see them all on the blog Figuras Promocionales (just search "monstruos" on the page). They are made of hard plastic. They were released in an undetermined amount of monochromatic colors. I've seen them in basic primary colors such as red, blue and yellow, plus others like light pink, purple and black. The sculpts range from almost-human creatures to truly bizarre monstrosities (for a prime example see the blue guy in the first photo above with the light hanging off his head and a little dude sitting in his chest). One day, of child, in one of these breakfasts prepared like paste to do comets(kites), touched me a plastic monster inside the Oats bag(Stock Exchange) 3 Toy bears. A bug(small animal) with three paws, a lantern in the tail(cola) and eyes of having smoked marijuana the whole night. I think that about says it all. What do you think about the Monstruos de Matutano? Have you ever come across any before? Do any of the sculpts in particular stand out to you? 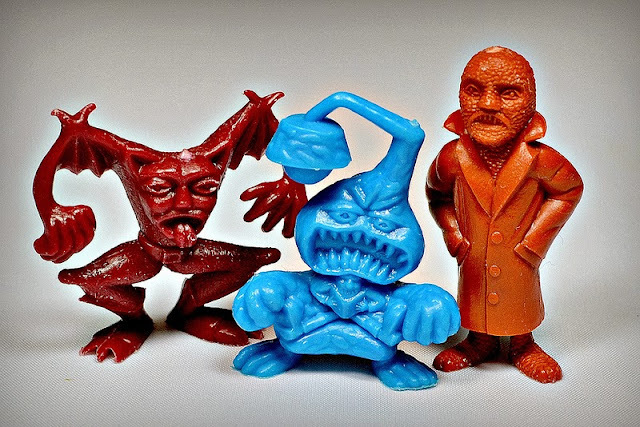 The Orange figure stands out from the others.It seems to be based on The Hideous Sun Demon,while the others are more cartoonish .Are they the same size as Dieners? -Bri F.
Yeah, there's quite a mix of sculpts with these. They're a bit smaller than Diener figures--I think around 2 inches. Lots of previously-unknown (to me) information there - the "proper" name for the things for one! 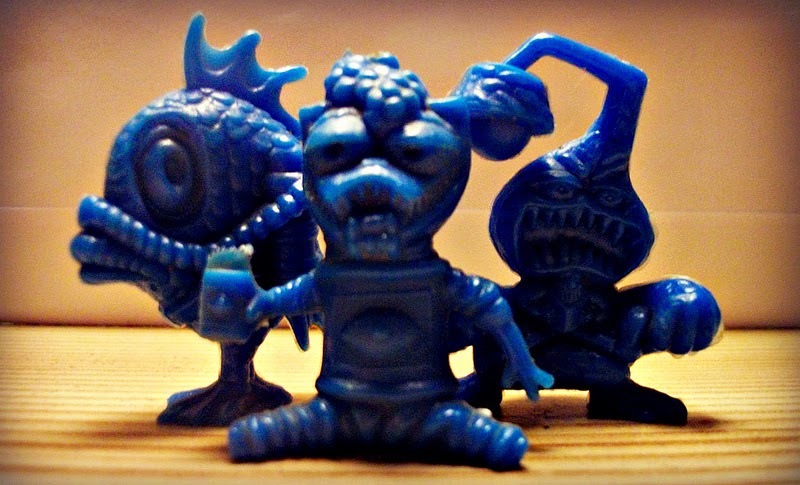 I found them on one of my generic "monsters" eBay searches, after wading through all the Pokemon, Universal, Scooby-Doo, Harry Potter, Monster High, MIMP and Godzilla stuff (found a lot of fun things that way). Thanks again for your contributions. 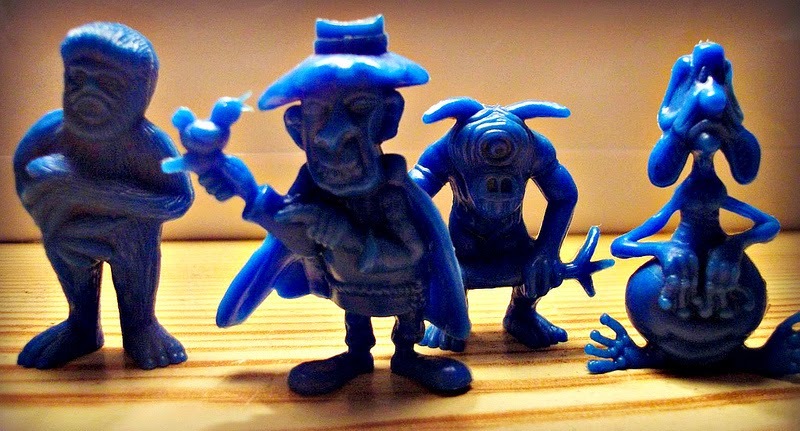 Hi, six of this caracthers were sold in Argentina in 1979 starring a science fiction comic, as a suplement of Anteojito magazine (one of the most popular magazines for kids in the country). According to the information that I found on internet, probably this six "monsters" (extraterrestrials for me by this comic) were made in Portugal. Tito was the manufactured and Disvenda the distributor. Probably this six were the first of the complete colecction. They looked to me more elaborated that the others, and I found in flickr an image of the packaging advertising "14 new extraterrestrials". If you want I can send you some images scanned from the comic that I bougtht with this "monsters" when I was a kid. Thank you very much for all this great info on these figures!